Over the past seven seasons, Paint the Park Pink Night has become one of the State College Spikes’ staple events by raising awareness of the fight against breast cancer. 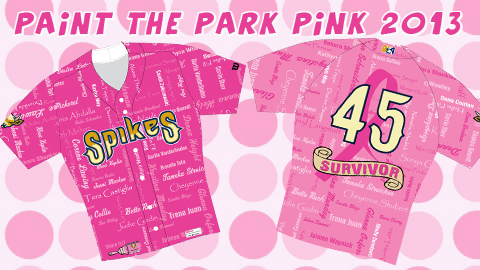 In 2013, the Spikes will join together with the Central PA community to put a personal touch on the battle, as fans can nominate family and friends affected by breast cancer to have their names commemorated on the Spikes’ special pink jerseys worn during the August 3 game at Medlar Field at Lubrano Park. Starting today, and extending through June 1, fans will be able to e-mail the Spikes at painttheparkpink@statecollegespikes.com with the names of anyone who has battled breast cancer. The first 200 names e-mailed to the Spikes will then be printed onto the Spikes’ pink jerseys, which will be worn by the team for the eighth annual Paint the Park Pink Night, presented by Mount Nittany Health. E-mail nominations must include the name of the person to be honored on the uniform, the name and address of the nominating person, and a short description of the person’s battle. The Spikes will be sharing some of these stories at the ballpark throughout Paint the Park Pink Night. This occasion marks the first time that any baseball team will be honoring those who have fought breast cancer directly on their game jerseys. The jerseys will then be auctioned off during the game to benefit the Breast Care Center at Mount Nittany Medical Center, with the winners receiving them on the field shortly after the final out of the night is made. In addition, the Spikes will use pink bats during the game, which will also be auctioned off to benefit the fight against breast cancer. Single-game tickets for the Paint the Park Pink Night game on August 3, as well as all 38 regular season home dates in the 2013 season, are now available to purchase online at StateCollegeSpikes.com, by calling (814) 272-1711, or by visiting the Medlar Field at Lubrano Park Box Office. The Spikes, the Class-A Short-Season affiliate of the St. Louis Cardinals, will open the club’s eighth season on Monday, June 17 at Medlar Field at Lubrano Park against the rival Williamsport Crosscutters (Philadelphia Phillies). Information on all Spikes single-game, season and group ticket packages is available at State College Spikes.com.